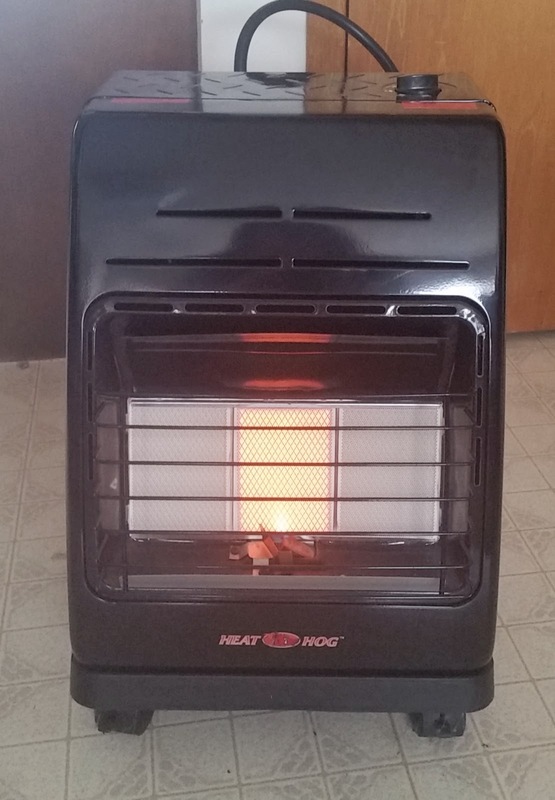 Its an "emergency heater". You need plenty of ventilation. But it kept our living area 74-76F while set on low. We even shut it off when we were too hot. A 20# propane bottle lasted from Thursday afternoon until Sunday afternoon. That is all I'm planning for this week. Still digging out from storm, have wound up most the extension cords. Now to figure out where I moved things! I'm linking with Oh Scrap, Monday Making, Moving It Forward, and Small Quilts and Doll Quilts. 16 Puss in Corner blocks--done with only natural light for the photo. Why? 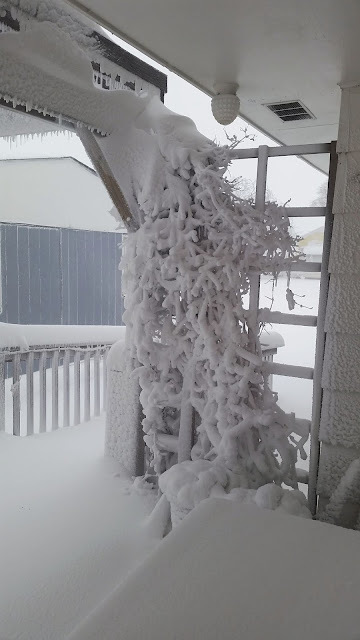 We had a blizzard this week--first rain, then sleet & ice, then heavy snow. Part of a maple tree fell on our power line to the house. 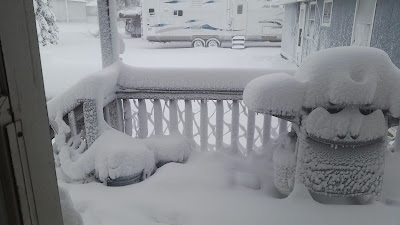 These are pics from early Thursday morning, it snowed/blew all day Thursday and into Friday morning. Knee deep to waist deep heavy wet snow. The entire interstate system and all the roads in South Dakota were no travel/closed. 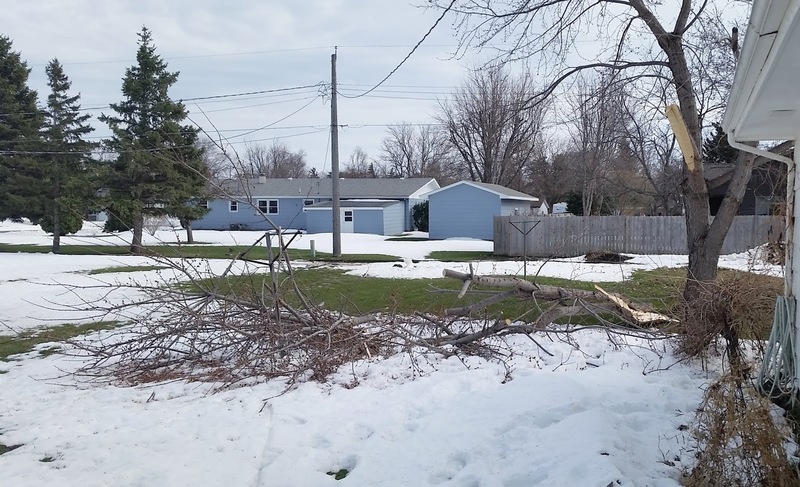 The branch fell Thursday afternoon. No pics of it, the live line was draped across our back doorstep, and we didn't go near it. The electric people came within half an hour, turned the power off, cut the branch up to free the line and restring it. Unfortunately it pulled the wires loose from the meter/box on the house and fried a lot of it. By Friday morning we had power in half the duplex (the sewing side) and the furnace repairman was here to repair fried parts on it. So, we have heat and lights on one side. But our living side is without power/heat until at least Monday. Ken had to work Thursday night, so I stayed in the local motel. 4 wheel drive only to get there. But the freezers and fridges have power now. 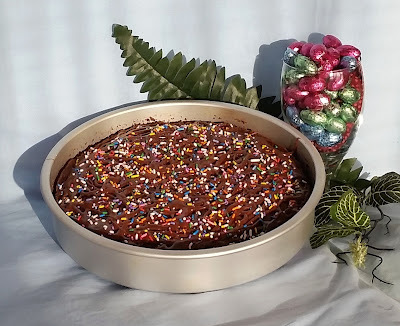 We have hot showers and can cook on the sewing side. Only an inconvenience. 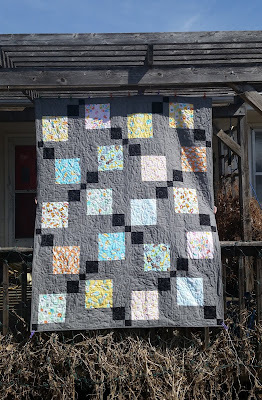 No pictures of the finished quilt, it will have to wait until next week when things are back to normal! 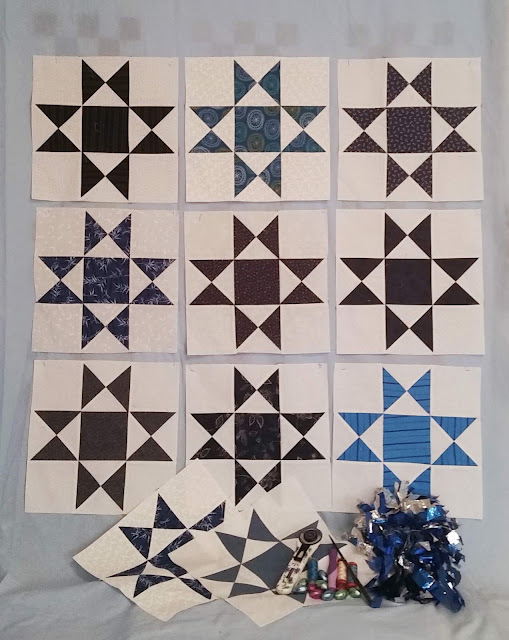 A backing is being dyed for the Chairs and Stars quilt. I'm linking with SoScrappy! Have a great week! Very simple setup. (You can see how the afternoon light shines in through the window). The photos were lightened a bit too much. Ah well, next time! Three little boys won't care about the photo! 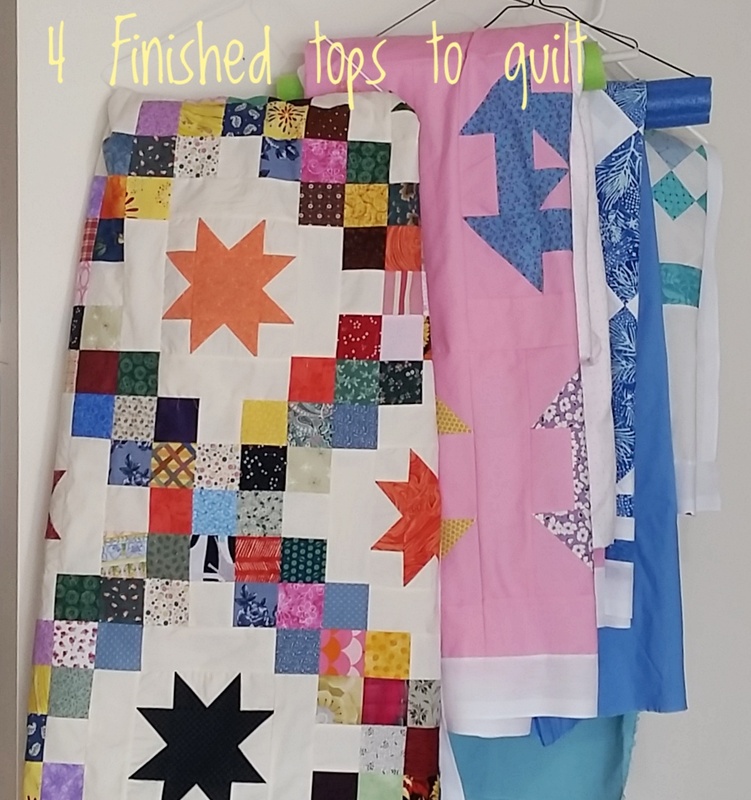 I finished piecing two baby quilts and have dyed two backings for them. Sewed binding whenever I could. I pressed some aqua/teal scraps for RSC blocks. That's enough for this week, I'm planning to sew with the Iowa Sweat Shop Ladies and 2Rs next weekend. MINI RETREAT!!! There are a few chocolates missing, blame Ken! 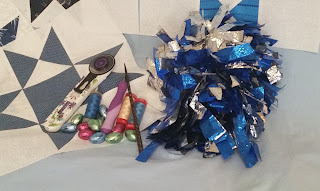 I'm linking with Oh Scrap, Monday Making, Moving It Forward, and Small Quilts and Doll Quilts. RSC Week 13--Teal (and GREEN)! Its been a busy week and I've been plodding along sewing. How are my goals coming along? Tonight I finished the 2nd small quilt top. The backing for one is dyed and ready. I'm linking with SoScrappy. I want to have it completely done by May 1st 2019. 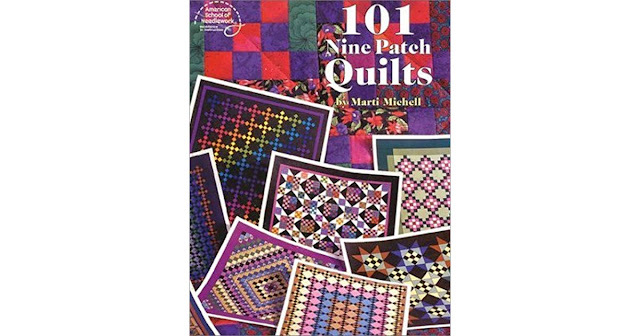 I'm linking with Elm Street Quilts. A rotary cutter, thread, chocolate easter eggs, my favorite seam ripper, a cute stiletto 2Rs gave me and the cheerleading pompom. I've long admired this quilt and vowed that "someday" I would recreate it. There is nothing more vintage than scrappy 9 patches! My quilt finishes at 44x51". 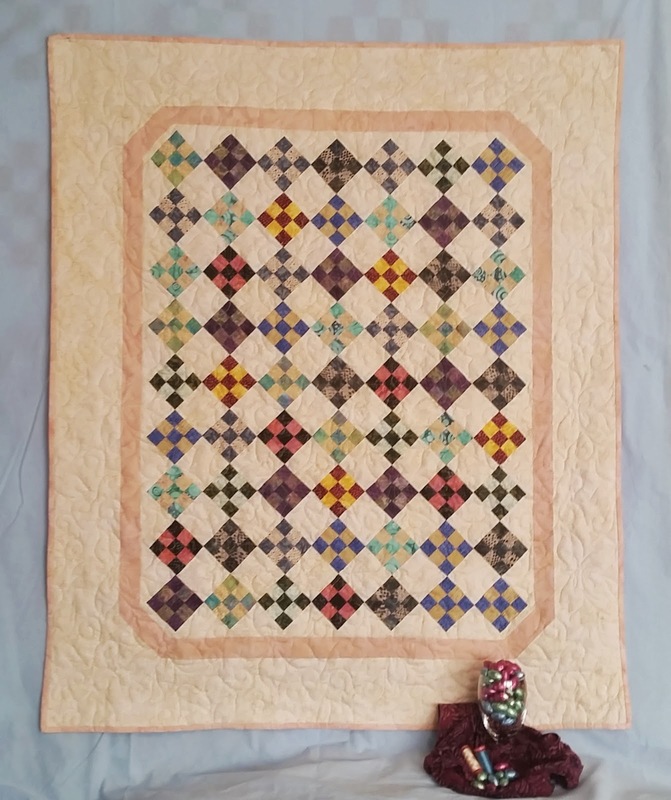 Its quilted with the Jody Beamish pantograph called Clematis--lovely frilly flowers paired with a light yellow thread. Tiny blocks look best with solid or tiny print fabrics, Island Batiks were a perfect choice. The props in this picture are my Island Batik scarf, spools of Aurifil thread, and a very necessary quilting tool---Chocolate Easter Eggs in a wine glass! A dark background would have set off the quilt better but I didn't have one. I will watch for a dark solid sheet at thrift stores. 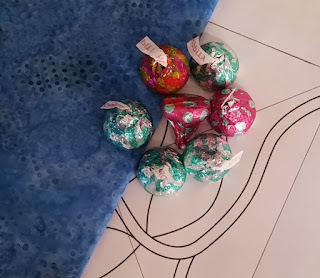 PS--Island Batik gave me these fabrics to play with. 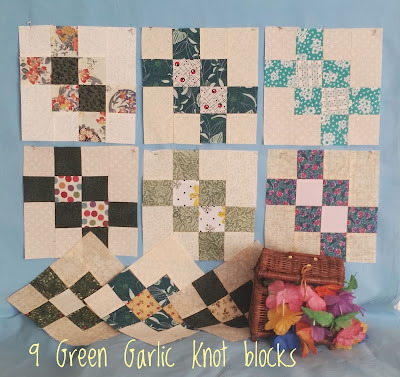 Some blocks only have a TINY TINY sprig of green, but that's good enough for me! 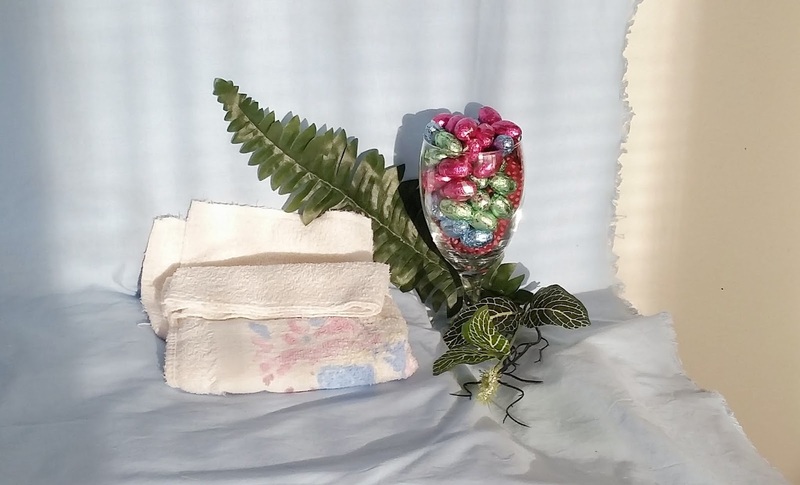 Changed my photo prop, an OLD green pottery pitcher stuffed with a piece of green fabric and some greenery stuck behind it. The Duck tape is underneath the pitcher and a long bluetooth speaker is behind the two blocks at the bottom. There's fabric stuffed in the pitcher because it has a big chip out of the edge. I'm linking with SoScrappy. 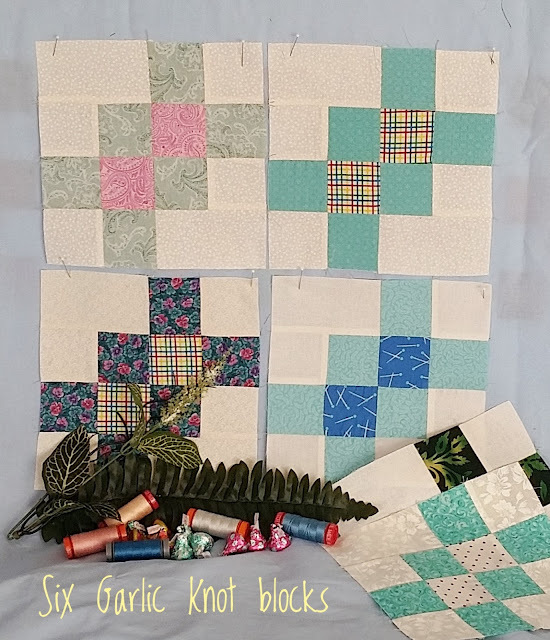 I love green so much I'm going to make green blocks in April too! Its a free pattern at Paint Brush Studio. Gray fabric is a new background fabric for me, I paired it with juvenile fabrics and a black. 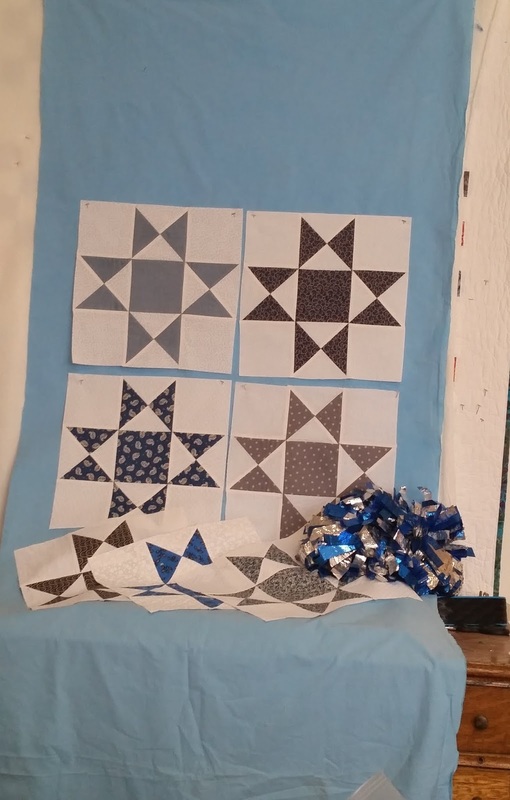 The backing is a white flannel with tiny blue/yellow polka dots. 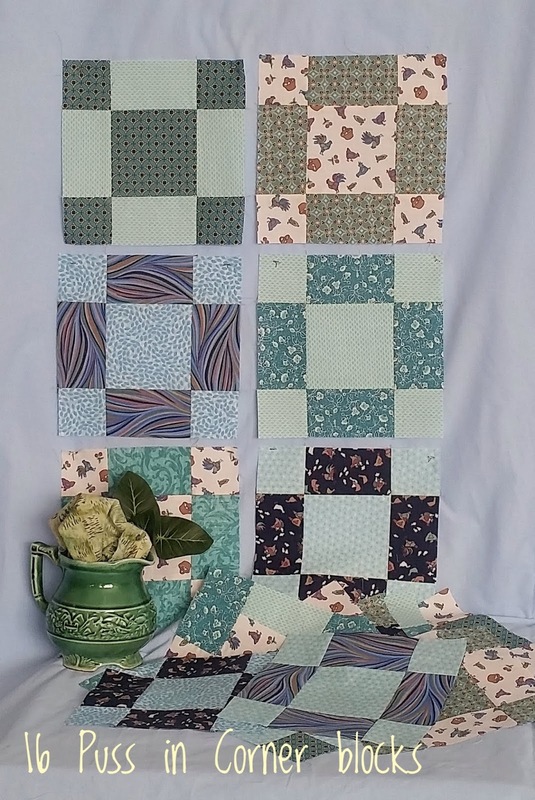 Its quilted allover with the pantograph Clematis by Jody Beamish. This panto is 13.5" but I enlarged it to 16", at 13.5" it was a bit too dense for me. There is a shadow across the top of the quilt. I waited about 2 hours before almost all of the shadow was gone. (If I had waited longer the sun drops below the large trees to the west and its all shadowed). The angle was not perfect, the final picture is better and I used the "perspective" tool to help. The top clips hold so well the quilt hung there even though the breeze from the south would pull the bottom loose from bricks/clips. This is on the west side of our house. I have another line on the east side of the garden shed/garage which can be used for morning pictures or if the wind is from the west. 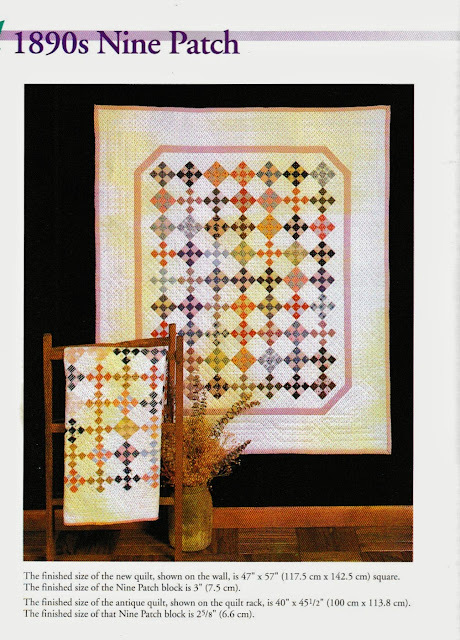 But the line is lower which means I have to take pictures with quilts hung sideways. I used 10.50yds to make the gray quilt. It was also my OMG for March. 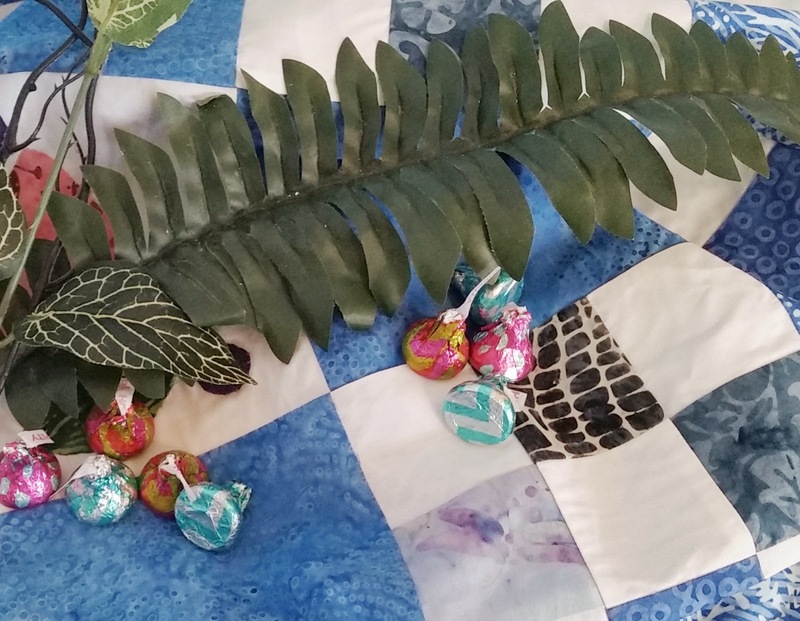 I'm linking with Elm Street Quilts. 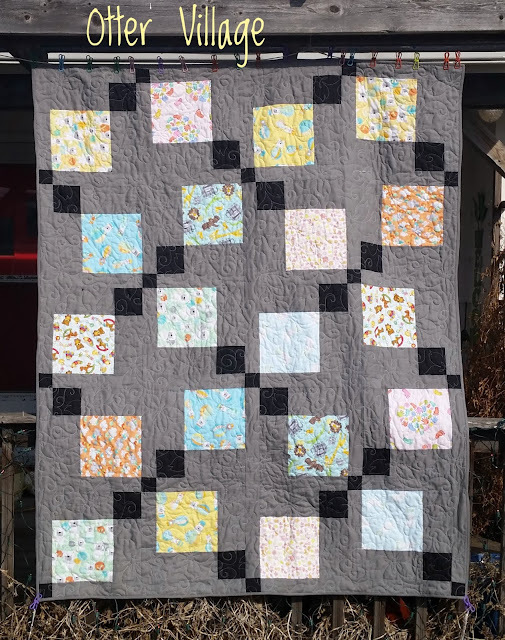 There are 36 of these blocks now, need to decide if I want 42 blocks (I like rectangular quilts) and how I will set them. Side by Side? Sashings? Cornerstones? Any suggestions? 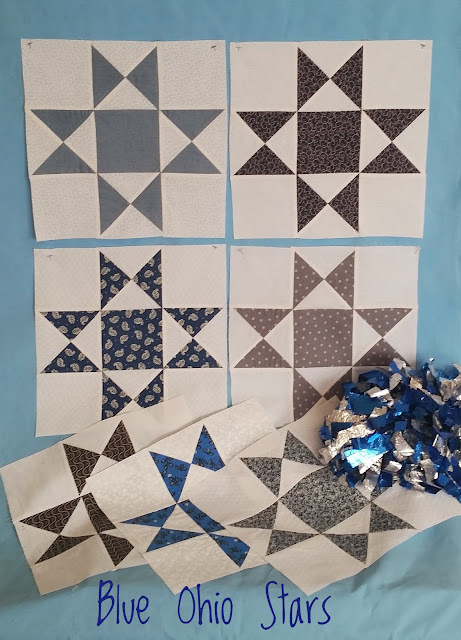 They are 12" blocks made with multiple whites and blues. Not near as eye appealing! That's it for this week. There are other life errands to do. A few "tweaks". Make sure the opening to turn the bag is on a section you know folds up for top stitching. Its a bit too deep, I used a 60" piece of fabric. Check the walker to see where the cross bars fall--mine has bars in a straight line so the velcro was perfect. 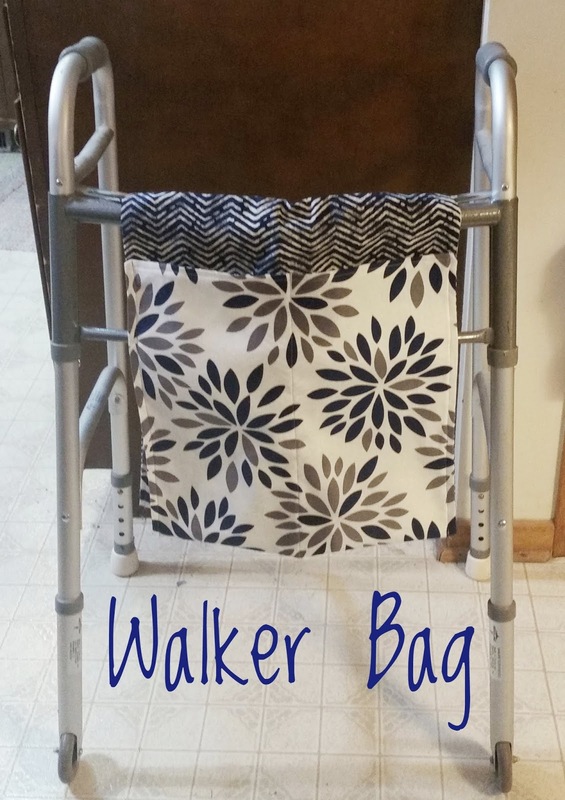 MIL's walker has angled braces so the velcro could be a bit lower. But I used wide velcro and I doubt she's be hauling bricks in it! 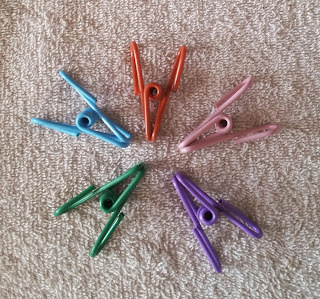 A very narrow pocket to hold a pen/pencil would be handy and easy to add. I thought it would be handy for my MIL's wallet, water bottle, phone. Thank you Candra for sending me this link--its exactly what I wanted. 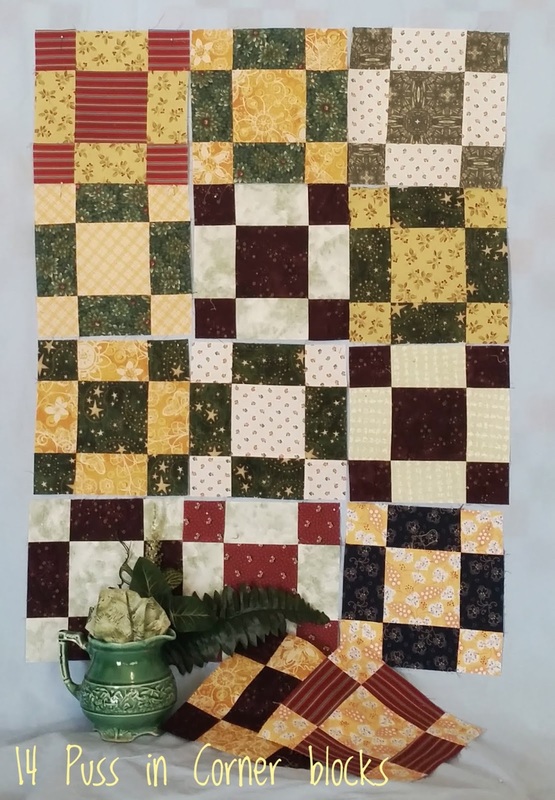 I'm linking with Oh Scrap, Moving It Forward, and Small Quilts and Doll Quilts. 9 more green Garlic Knot blocks. And Liz mailed me a box with more green scraps and chunks! WOOHOOO!!! I have a few more days to work on my goals. The blue/brown quilt needs two more passes on it. No decision on backing yet for the 9 patch quilt.